With the wrong settings the chip can become impossible to program or run properly. To add more confusion the fuses are “active-low”, ie. you have to write 0 to activate a particular feature, and 1 to disable it. In case of problems all fuses can be always set by high-voltage parallel programmer (eg. AVR Dragon). Parallel programming requires almost all MCU pins to be connected to the programmer. It is only practical with DIP chips. Making a breakout board for SMT device will require more effort than simply replacing the (locked) chip. 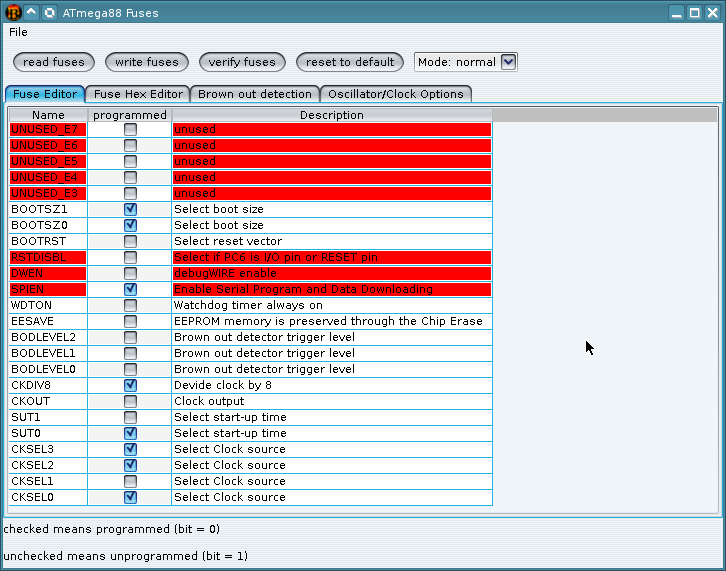 Calculating hex values of the fuses to be passed to avrdude is hard and risky – ideal problem for a GUI. 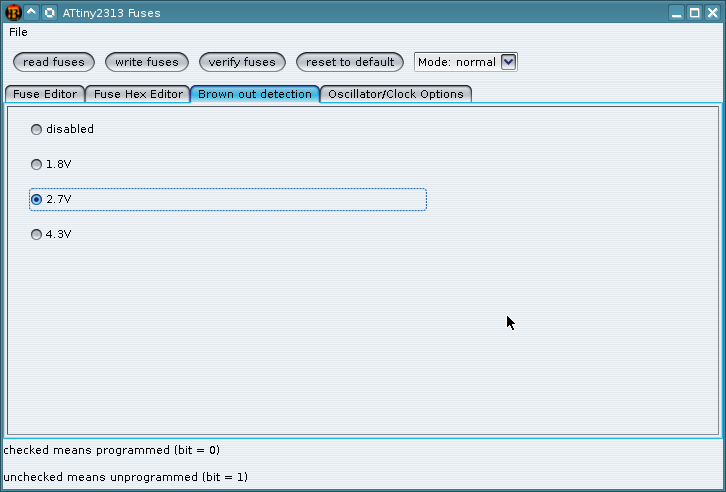 Burn-O-Mat is a nice, cross-platform GUI that simplifies fuse setting. It is a Java frontend to avrdude. For Linux I recommend downloading the zip file and setting everything up manually. 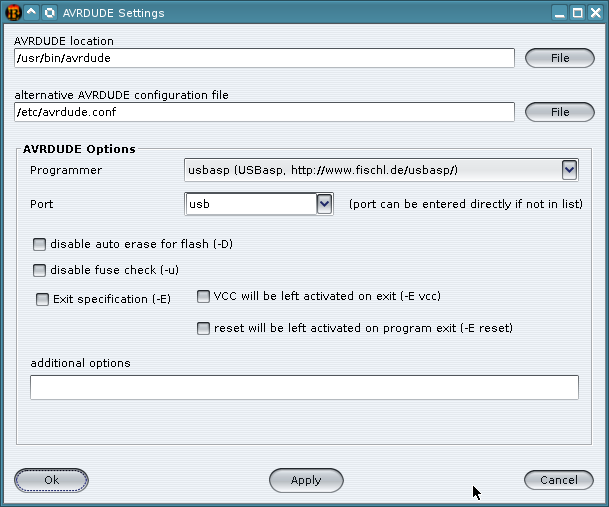 Avrdude has to be installed separately in a way specific to your Linux distro. 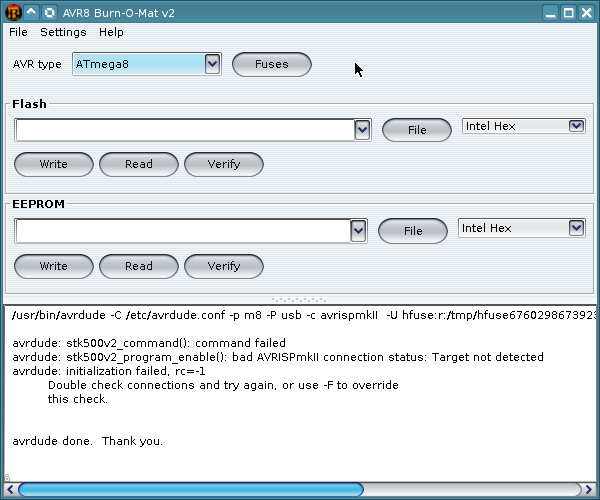 Burn-O-Mat requires some initial configuration, you have to go to Settings->AVRDUDE and put the right AVRDUDE location and configuration file location. 99% of the time it will be either /usr/bin/avrdude and /etc/avrdude.conf or /usr/local/bin/avrdude and /usr/local/etc/avrdude.conf. If the configuration file path is wrong, then the list of programmers will be empty. After changing those settings you have to restart Burn-O-Mat. Next you have to pick the right programmer and port. Port can be something like /dev/ttyUSB0 or /dev/ttyACM0 if the programmer looks like a serial port (STK500, Arduino bootloader) or simply usb for other devices (eg. AVR Dragon, USBasp). After setting the programmer and port you can try to read fuses from any chip, without the target chip connected, but with the programmer attached. Reading will of course fail, because target connection is missing, however you can see in the main window, that avrdude was successfully communicating with the programmer. If the log is empty, or there are other errors it means that configuration is most likely wrong. 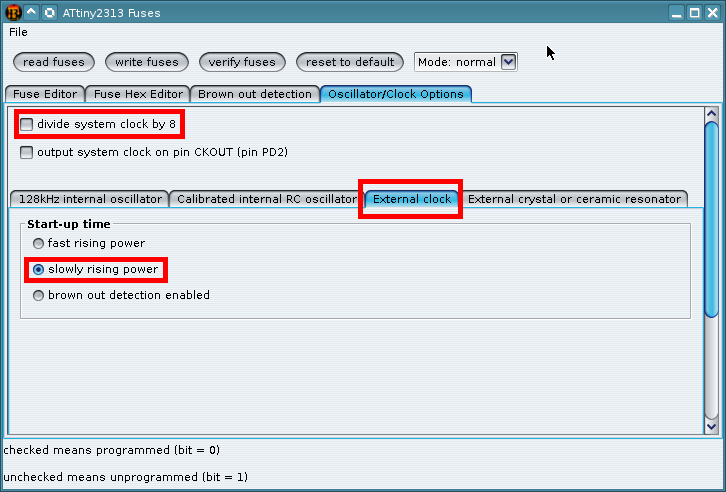 After connecting target board to the programmer you can click “write fuses” and “verify fuses”. If the last step ended successfully, then your AVR is ready for work.